"I wanted the very youngest to participate in Christmas activities by using their senses." 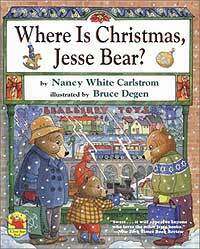 Jesse Bear is looking for Christmas. And he finds it everywhere — when trimming the tree, baking cookies, and going ice-skating in the park. But Jesse Bear feels Christmas most of all when he's with his family on Christmas Eve, and tucked in his bed waiting for Santa!